Cocos Island and Malpelo Island with the Undersea Hunter Group - Located 300 miles off the coast of Costa Rica, Cocos Island is one of the more remote and pristine marine environments on the planet. Teeming with marine life, Cocos Island is both a World Heritage Site and a Costa Rican National Park. The island is ringed with more than 18 different dive sites, many of which offer hammerhead and other shark viewing opportunities. 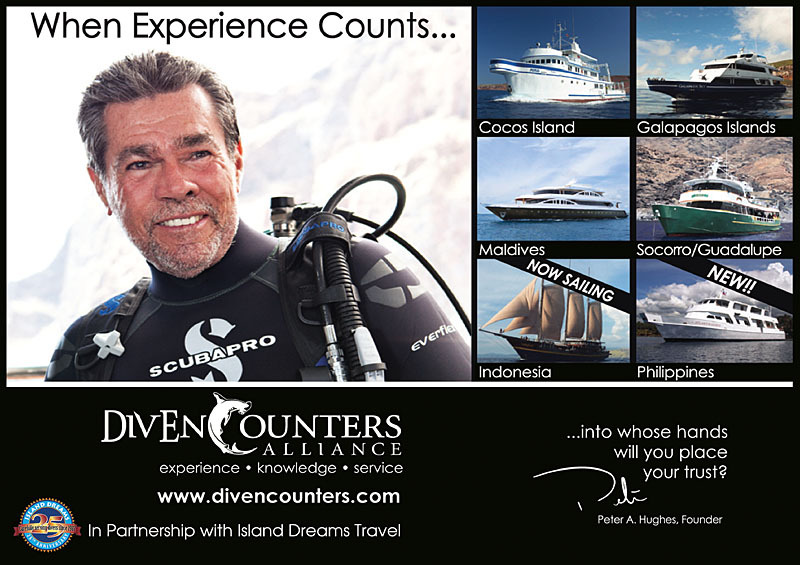 Cocos Island diving is "adventure diving at its finest". Hammerheads (individuals, small groups, and schools) are just about constant companions on many dives. Add countless white tip sharks, eagle rays, dolphins, and even the occasional Whale Shark and you start to get the idea that Cocos is one of the most intense marine life habitats in the world. Add large numbers of turtles, Moorish idols, jacks, tuna, and plenty of shark action besides hammerheads and you know you have found the right place for high octane adventure diving. The Undersea Hunter Group also visits remote Malpelo Island, some 314 miles off the coast of Colombia in the Eastern Pacific. Affectionately known as "La Roca" (The Rock), Malpelo also boasts similar underwater terrain and habitat as does Cocos - but the marine life is even more concentrated (if such a thing is possible) as the island covers a smaller area. Undersea Hunter Group - The Undersea Hunter Group is one of the most experienced live-aboard operators in the diving world, and has called Costa Rica home since its inception in 1990. For over 20 years, the Group has specialized in diving and expeditions on board the adventure and research vessels SEA HUNTER (115 ft., 36m - 19 guests) and UNDERSEA HUNTER (90 ft., 28m - 14 guests). Both vessels combine the stable platform and dependable performance of research vessels but are outfitted on the interior with luxury live-aboard accommodations for guests. Diving is typically done from hard hulled "skiffs" for customer comfort. Founders Avi Kapfler and Yosy Naaman have extensive experience and carry impressive credentials both as explorers and as sea captains. The Group also specializes in hosting major underwater film projects and other deep sea research projects using a third vessel, the ARGO, and its DeepSee submersible. Galapagos Islands aboard M/V Galapagos Sky - The remote Galapagos Islands are located across the equator, 605 miles to the west of mainland Ecuador, and are considered by many to offer some of the most exciting diving in the world. Located at the confluence of three major oceanic currents, visitors to the islands of the Galapagos will find a stunning and diverse array of underwater formations and marine life. An archipelago of 15 main islands essentially untouched by time since visited by Charles Darwin in 1835, you'll find a natural haven for wildly diverse marine life. Diving in the islands is generally divided into two seasons: whale shark season and manta season. Water temperature and conditions vary considerably by season, and also changes as you move from island to island, a major contributing factor to the overall density and diversity of marine life. Hammerhead shark encounters in the Galapagos Islands are perhaps without equal anywhere in the world. They are your constant companions on dives at Wolf and Darwin Islands seen individually, in small groups or as walls of sharks numbering in the hundreds. Whale sharks, hammerhead & Galapagos sharks, five types of rays, Galapagos fur sea lions, sea lions, schooling pelagics, colorful reef fish, corals, and invertebrates are just the tip of a "once-in-a-lifetime" iceberg of exceptional diving encounters in the Galapagos. You are never exactly sure what will happen on any dive, but you can count on high octane, pulse-pounding experiences on nearly every Galapagos dive! Galapagos offers more advanced diving and is not well suited for newly certified divers - 200 logged, open water dives is recommended. M/V Galapagos Sky - The M/V Galapagos Sky (formerly the M/V Sky Dancer) is a 110 ft. / 33m luxury live-aboard yacht cruising and exploring the Galapagos Islands. The vessel was designed by a team of naval architects in close collusion with Peter A. Hughes and built by current owner Santiago Dunn in 2000 to meet and exceed all maritime standards. Launched in 2001, the M/V Galapagos Sky features one of the most experienced crew of any Galapagos live-aboard. Accommodations include eight private luxury cabins with full en-suite services including private head/shower, ample storage space, bathrobes, and biodegradable marine safe toiletries, hair dryers etc and spacious lounge and dining areas are also featured. Since all dives in the Galapagos Islands are current or drift dives, the vessel also features two 20 ft. inflatable tenders with experienced operators and Divemasters. Besides being a luxury live-aboard visiting the diving legends of Wolf and Darwin Islands on every trip, the M/V Galapagos Sky also prides itself on providing a level of personalized service not found on many live-aboards. Maldives aboard M/V Orion - The Maldives Archipelago, located in the equatorial waters of the Indian Ocean, is comprised of 26 different atolls and more than 1280 low lying islands, 85% of which are uninhabited. With no discernible river run-off, the coral reefs of the Maldives are pristine and feature some of the most diverse coral formations on the planet. The natural water flow in and around the atolls creates the ideal environment for wall dives, channel dives, drift and current dives, and shallow "critter" dives. Underwater, the Maldives landscape is also dotted with pinnacles (called Thilas and Giris in Dhiveli, the local language) which soar from the depths and create unique habitat for marine life. Whale sharks, pelagics, and giant mantas are the big animal attractions and may be found throughout the archipelago on a seasonal basis (we adjust our cruises to the seasons to visit the right atolls). Dog-tooth tuna, jacks, eagle rays, dolphins, grey reef sharks, and lots of other shark species round out the larger species of marine life. The reef fish of the Maldives come in every hue and color imaginable, and offer every photographer and videographer "once in a lifetime" photographic opportunities. The reef fish are easy to approach - another plus for Maldives diving. Look for thousands of red tooth triggers, blue striped snappers, and fusiliers, just to name a few. M/V Orion - Newly christened in 2009, the M/V Orion is 135 ft / 41 m of dedicated luxury live-aboard, regularly cruising the pristine waters of the Maldives. Due to the unique geography of the Maldives (islands, atolls, channels), most of the diving is done from our own 45 foot diving tender (locally called a Dhoni). This allows us access to the very best diving sites with minimal environmental impact. Your dive gear is stored on the Dhoni, allowing the full 135 ft. of the M/V Orion to be dedicated to guest comfort. You'll find large and luxurious lounges, dining areas and spacious cabins with plasma TV's. The M/V Orion features twin bed, double bed, plus junior and master suite configurations and all cabins are fully equipped with in-suite bath amenities. 24 hour concierge service is also provided to attend to your every need. Socorro Islands, Mexico aboard M/V Solmar V - The Socorro Islands (the Revillagigedos Archipelago) are composed of four remote islands located in the Pacific Ocean roughly 250 miles southwest of Cabo San Lucas, Mexico. They are uninhabited, wild and unpredictable and have often been called "the Mexican Galapagos" because of the startling size and array of marine life. Three of the islands (San Benedicto, Socorro, and Roca Partida) are typically visited on any of our live-aboard cruises. If you are looking for the world's best underwater encounters with Giant Manta Rays (up to 22 ft wing span), you'll find them at the Socorro Islands. Not only are the mantas not afraid of divers, they welcome us with open wings! Gliding just above us in blue water, stopping and hovering just a foot or two away while enjoying a diver induced bubble Jacuzzi - unlike other marine life they love our bubbles! These manta encounters are simply so unusual there's nothing to compare in the diving world. But that's just the beginning of our Socorro Islands scuba adventures. You can see over seven different species of sharks in these waters, humpback whales, whalesharks and plenty of accommodating wild bottlenose dolphins that pose for your camera or video, just a few feet away! We've even snorkeled with pilot and false killer whales! Throw in the remarkable schools of tuna, jacks and endemic reef fish and it's a very amazing place! See for yourself: Latest Solmar V Trip Video. Guadalupe Island, Mexico aboard M/V Solmar V - In the summer months of Aug-Oct we move the Solmar V 850 miles north to Ensenada, Mexico where we run trips to the infamous Guadalupe Island. Our trips consist entirely of high voltage Great White Shark Cage Dives! With a thriving population of Great White Sharks in clear, blue water this is fast becoming the best place worldwide for video and photography of these majestic sharks. M/V Solmar V - The Solmar V was the first live-aboard to run regularly scheduled trips to the Socorro Islands, beginning in 1992. This 112 ft. / 34 m vessel has consistently been upgraded to maintain the highest possible level of live-aboard excellence. With 12 cabins the Solmar V cruises with 22 passengers and a crew of 10. The boat is air-conditioned throughout with private shower/head, tv/dvd, pillowtop mattresses and down pillows in every stateroom. We run redundant backup systems in all departments so you never miss a dive due to equipment issues. Diving is done from the very spacious dive deck and swim/dive platform or from one of our rugged 21' Achiles inflatables when diving with drifts or currents. Our crew, many of whom have been with us since the early days, are without a doubt the most experienced crew operating in these waters and considered experts in local conditions and weather. We consistently deliver the best possible diving on all our cruises. Expect well polished mahogany and brass highlights in all of our cabins and public areas, excellent food by Chef Tony, and incredible service! What you won't see is all of the state-of-the art technology (satelite communications, side scan sonars, multiple radars, titanium nitrox membrane system, redundant generators, hull stabilizers, hot & cold freshwater systems,) that support every luxury cruise. M S/V Waow - The motor sailing vessel Waow is a traditional 198'/60m sailing vessel, constructed entirely from Indonesian iron wood using traditional methods. Her grandeur will evoke feelings of the Southern Seas, liberty, adventure, comfort, quality and style. The vessel has been rigged as a classic "Topsail Schooner" with three 132'/40m steel masts carrying 9,900 sq. ft/ 920 sq. m of sail and with twin 550 HP marine diesel engines in addition to the sailing capabilities, M S/V Waow will be able to sail, motor-sail or motor comfortably around the Indonesian Archipelago depending on the prevailing weather conditions. The service and amenities aboard the M S/V Waow in keeping with the vessel are of course five star. Accommodations include nine luxury staterooms with en-suite facilities, in-house movie & entertainment systems with in-room internet connection via satellite. There are six deluxe staterooms (247 sq. ft/23 sq. m) on the Lower Deck, two superior staterooms (226 sq. ft/21 sq. m) located on the aft Main Deck with furnished balconies and one magnificent master suite (484 sq. ft/45 sq. m) on the upper deck also with furnished balcony (323 sq. ft/30 sq. m) providing additional private space for pre/post dive relaxation. The spacious and well appointed lounge & dining salon are located midship on the Main Deck with full service bar and restaurant. Additional features include state of the art dive facilities, multimedia equipment, satellite communications featuring Wi-Fi internet and phone, spacious dining and lounge areas, sun decks, dedicated photographic room, three comfortable dive tenders and a full service bar and restaurant. The Philippines sailing with M/Y Atlantis Azores - The 7,107 islands that make up the Philippines are in the heart of the coral triangle and offer some of the hottest new dive sites on the planet. Considered the third-largest English-speaking country in the world, the Philippines have three main islands - Luzon in the north, Visayas; a cluster of smaller islands in the middle, and Mindanao down south; the largest island. One can dive in clear waters, discover cliffs covered with sponges, colorful corals, gorgonians, turtles, sharks, rays, and even the very rarely seen exotic fishes like harlequin ghost-pipefish, camouflaged frogfish and fire gobies. Thanks to the convergence of the nutrient rich waters of the Pacific Ocean, South China Sea and Celebes Sea, divers can be a spectator to over 2,000 species of marine fish as well as more than 400 out of the 500 known coral species in the world. M/Y Atlantis Azores - The motor yacht Atlantis Azores is positioned strategically to service remote diving areas with spectacular diving throughout the Philippines islands. Itineraries, which vary with the best diving conditions, include: Southern Leyte, Bohol, Tubbataha Reef, Cebu and Malapascua. Whichever exciting Philippine destination you choose, this beautiful yacht and professional crew will ensure you get the most from your diving vacation. Atlantis Azores has seven deluxe staterooms with double and single berths, hair dryer, private head and shower. There is also one larger owner's suite on the top deck with upgraded amenities. The spacious dive deck allows 16 divers to gear up in comfort with plenty of room and personal storage space. A roomy three-tier camera table and charging station is available for photographers. All divers have their own storage area for dive equipment. Most dives are done from two zodiac tender boats with only a short ride to dives sites. The Azores features a spacious partially covered sun deck with chase lounges, complete wet bar, hot tub, an assortment of sitting areas with tables for your relaxation between dives, air-conditioned salon and dining area and chef prepared meals. For More Information: For availability, pricing, and additional details, please contact your adventure experts at Island Dreams Travel. We are here to serve you. While we do our very best to portray every detail accurately, please note that all information, pricing, itineraries, and trip inclusions on this website are subject to change without notice.